Cavity Prevention - Michigan City Dental, P.C. | Michigan City Dental, P.C. Cavities are a very common dental health issue among children, and it is something we see every day. The best way to fight cavities is to prevent them from occurring! 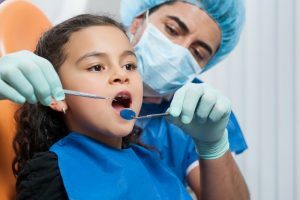 As a parent, you can help that cause by instilling good dental care habits in your children from a young age, and making sure they follow them. One of the most important habits for kids to form is proper brushing. Many children do not brush frequently enough, and can often use improper techniques when they do. We know it can be difficult to get kids to brush their teeth, but doing so will save you time and money in the long term! Keep your kids on a regular routine, brushing at least twice daily. It is also important to brush in the morning as well as at night before bed. Make sure your children are using circular motions to brush all areas of the teeth. They should brush for approximately two minutes, don’t let them off the hook! It is also important to apply gentle pressure, making sure not to brush too hard. Flossing is just as important as brushing, though unfortunately many people skip this vital step of home dental care. It also helps remove plaque that can turn into tartar, and helps you reach parts of your child’s teeth that a toothbrush cannot. Make sure to get underneath the gums and floss between each tooth. This will help remove any debris that may accumulate from eating, keeping your child’s mouth from developing harmful bacteria. If you keep your kids to a regular routine of flossing and brushing, they are much less likely to develop cavities! One of the lesser known aspects of at home dental care is managing your child’s diet! The foods we eat have an effect on our teeth so it is important to make sure your kids aren’t eating too much of potential hazardous foods. Sugar is an obvious culprit, as overeating candy and sweets can cause serious damage to your child’s teeth. But too much starch can also be a problem, as starches can break down into sugars over time! Sticky or gummy foods can also make it harder for your child to properly brush and floss their teeth. As a parent, we know it can be difficult to get your kids to adhere to good dental hygiene habits. But the rewards for doing so will prevent you from spending time and money at the dentist’s office! If you have any questions or concerns about your child’s teeth, please contact us today. We would be happy to speak with you and your children!